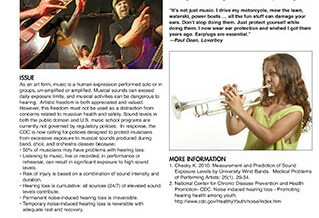 Unique to Athletes and the Arts is our collection of one page educational fact sheets, devoted to helping and guiding performing artists, music teachers and other educators, medical professionals, and all those instrumental in the well-being and care of any performing artist. Visitors are encouraged to share the link to our collection or to any specific fact sheet’s post, or print or email the PDF itself (do not, however, distribute any PDF/fact sheet on a different website or publication without our prior approval). Hello. I am a PAMA member and physician assistant in orthopedics in New Hampshire. I am trying to establish a relationship with area (Upper Valley) music programs. I request to have access to and share your 1 page information sheets with the music teachers and students. If given position then please inform me how to access the PDFs for download.